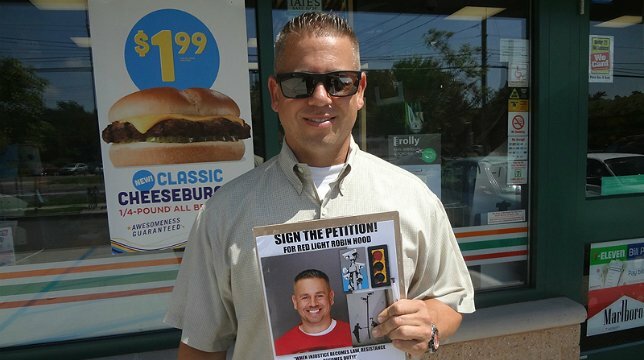 Outspoken opponent of Suffolk County red light camera program braves summer heatwave while seeking signatures for petition backing his run for State Senate in District 2. "Red Light Robin Hood" Stephen Ruth. Commack, NY - August 12, 2016 - Centereach resident Steven Ruth, dubbed the “Red Light Robin Hood” by the public-at-large, has been an outspoken and very active opponent of Suffolk County's red light camera program, claiming that the initiative is more about filling the county's coffers that it is about saving lives. Taking a very aggressive approach in combating the cameras, Ruth has been arrested twice in the past year after very publically sabotaging many of the devices which are responsible for taking pictures of the license plates of motorists who run red lights, who in turn receive an $80 ticket in the mail for the offence. However, Ruth maintains that the cameras are but a cash grab for the county, and that they are responsible for causing more accidents than they actually prevent; this is a charge that many lawmakers deny, but Ruth has also found many supporters of his cause throughout both local government and the community as well. Taking his campaign to the next level, Ruth recently announced his intention to run for State Senate in District 2 on the Libertarian ticket this upcoming November, challenging Republican incumbent John J. Flanagan; to that end, on Friday, August 12, Ruth camped out at the 7-Eleven located at 454 Veterans Highway and Harned Road in Commack to gain required signatures from registered voters to get on the ballot. While Ruth only needs 3,000 signatures to qualify, he stated that his goal is 10,000 just to give himself some extra insurance should any of his signatures be disqualified for any reason. Steven Ruth seeks signatures for his State Senate bid. As of the time that this video was shot, Ruth was braving a scorching summer heatwave while questing for his signatures; when we left him, he was already at 7,500 and counting. Subject: LongIsland.com - Your Name sent you Article details of "VIDEO REPORT: "Red Light Robin Hood" Stephen Ruth Pounds Pavement Seeking Support for Senate Election Bid"